^ a b c d e f g Eritrea country profile. Library of Congress Federal Research Division (September 2005). This article incorporates text from this source, which is in the public domain. ^ Asfaha, Yonas Mesfun; Jeanne Kurvers; Sjaak Kroon (2006). "Literacy use and instruction in multilingual Eritrea". Leeds African Studies Bulletin. ^ "Eritrea" (PDF). World Data on Education. United Nations Educational, Scientific and Cultural Organization. September 2010. Retrieved 2012-01-25. ^ Baseline Study on Livelihood Systems in Eritrea (PDF). National Food Information System of Eritrea. 2005. ^ a b Habtetsion, Efrem (2006-08-03). "On Developing Higher Level of Education". Archived from the original on 2006-08-30. Retrieved 2006-08-03. ^ Kifle, Temesgen (April 2002). Andreas Knorr; Alfons Lemper; Axel Sell; Karl Wohlmuth (eds.). 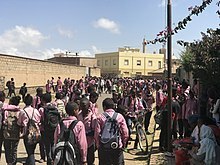 "Educational Gender Gap in Eritrea" (PDF). Berichte aus dem Weltwirtschaftlichen Colloquium der Universität Bremen. Institute for World Economics and International Management. 78.